First year out of school is challenging for many students - there are new demands, new opportunities and bigger life decisions. This program will prepared deaf and hard of hearing students in Victoria to plan for a future after school by participating in a six-day intensive program. This is the first Transition Youth Program organised by deafConnectEd. It is designed for high school students up to 19 years of age. The purpose of this program is to help students who are in their final year of school and who are about to enter their post school journey to TAFE/university to ensure they go into this next stage with confidence and excitement in a bilingual environment. The opportunities are endless and so it is imperative we equip young adults with the tools they need to find the right vocation. During the week long program deafConnectEd will take students to a range of different universities and training providers where they will be able to ask questions and speak to educators and students in order to gain a greater understanding about their desired vocation. deafConnectEd is excited to be running this Transition Program as a pilot to gauge the program's value for students. deafConnectEd is particularly grateful to Melbourne Polytechnic and Deaf Children Australia for their generous financial and in-kind support for this pilot program. We are also very pleased to be working with Career Educators Association of Victoria, William Angliss Institute, Holmesglen TAFE and Deakin University. All these organisations have provided valuable information and activities to support this program. 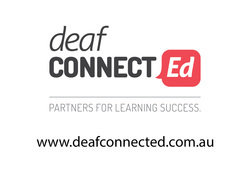 ﻿deafConnectED is committed to the inclusion and successful outcomes of students who are deaf or hard of hearing in the tertiary education sector. In supporting this commitment, we develop innovative education solutions that enhance inclusion and participation through industry and community partnerships with educators, support staff, students, families and community organisations.